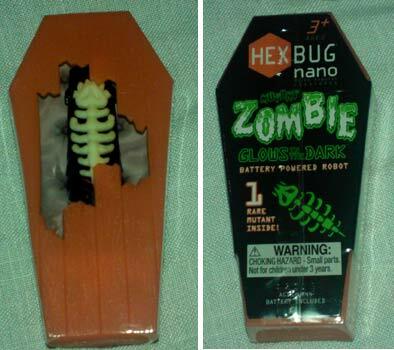 I was fortunate recently to win a Limited Edition Zombie Hexbug Nano – a glow-in-the-dark critter that lives in a coffin. Somewhere amongst all the gifts, gadgets and gizmos I’d forgotten about these great little bugs which provide hours of fun for us kids of all ages. The tiny Hexbug Nano (rrp £8.99) maybe small by nature but is the mightiest of them all . Powered by a motor with 12 legs, the Nano uses vibrations to move and explore its environment, quickly finding its way round complex mazes, flipping itself to right itself and find its balance. When meeting an object, the Nano quickly switches directions and scurries off with random persistance. 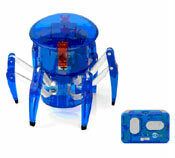 The Hexbug Crab (rrp £14.99) is another clever little critter. It uses light and sound sensors to hide in the dark and run from noise. You can control where it scurries and make it change direction by clapping – hours of fun! The Hexbug Original (rrp £10.99) senses objects in its path and avoids them using its bump sensor feelers. Like the crab, you can control where it scurries and change direction by clapping. Watch out for the high-speed Hexbug Ant (rrp £10.99) with its probing, tactile antennas and hooked claws. This little bug has front and rear touch sensors allowing it to manoeuvre around objects whilst its wheel-legs scurry around with crazy speed. So if you’re looking for a fun new family, they’ll make a great gift running riot around the house. 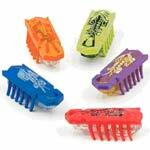 You can buy them directly from www.hexbug.com or a number of shops including Hamleys and Toys R Us. This entry was posted in gadget, Gifts, kids and tagged hexbug, hexbug nano. Bookmark the permalink. I remember these! Very simple but strangely entrancing!